This is a themed indoor amusement park, amusement project is very rich, mainly by the Themed Pirate Ship, Singe Slip Rope, Themed Sail Mural, Themed Soft Octopus, V-bridge, Tube Slide, 3 Level Vertical Tube, 3 Level Light Tower, Themed FRP Shark, Suspended Web Crawl & Arch Tube and Domed Window, Ball Pool. Unleash your child's imagination in a world Under the Sea. Through play, children develop the self-esteem, coordination, and social skills necessary to grow. 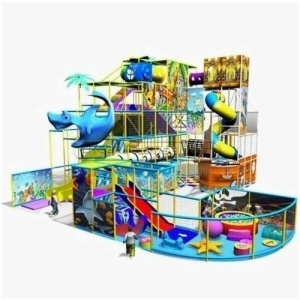 Children will bounce in the Moon Bouncer, go down the Turbo Slide, crawl through the climbing structure, or climb up to the top of a sea castle.